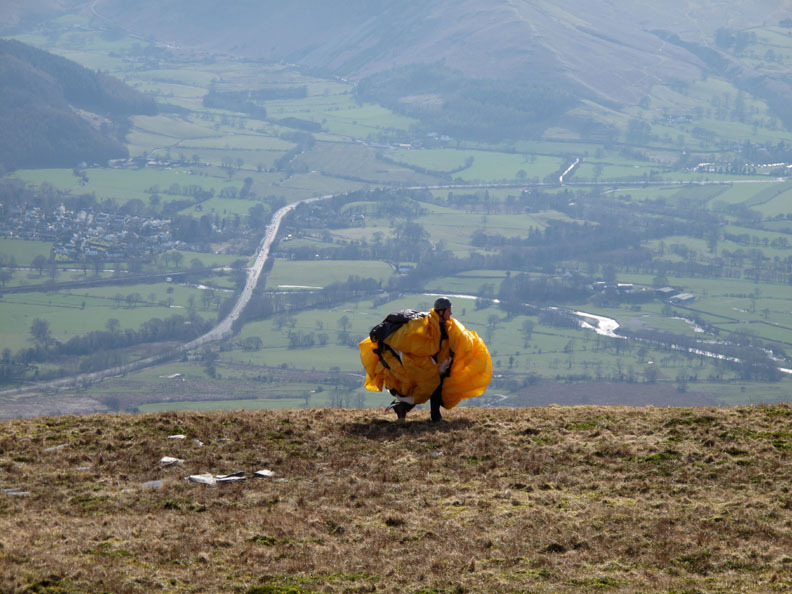 Date & start time: Saturday 10th April 2010, 10.30 am start. 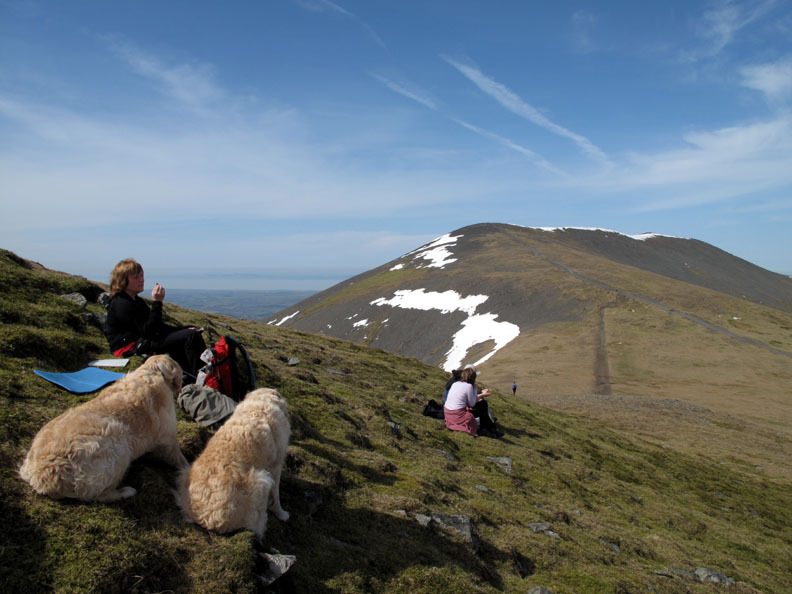 Places visited : Gale Road, the Skiddaw House track, Lonscale, Jenkin Hill, Skiddaw Little Man, Skiddaw and back down the main path to Gale Road. 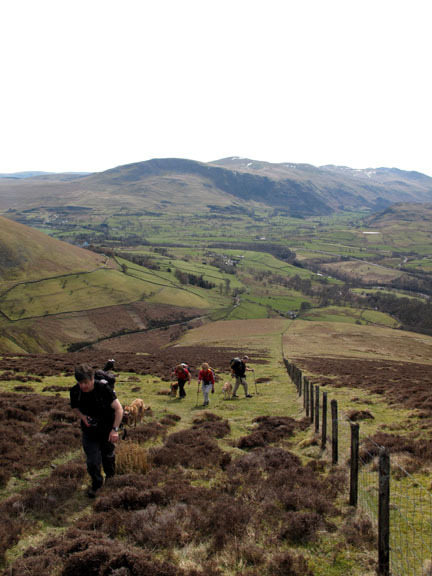 Walk details :7.9 mls, 2600 ft, 6 hrs including lunch. 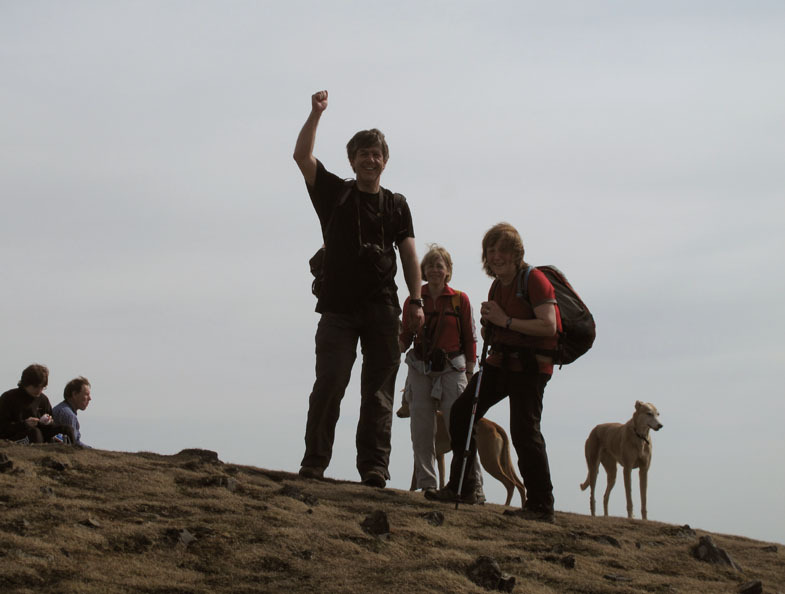 Walked with : Neil, Jo, John, Ann and the dogs, Jodie, Amber, Polly, Harry and Bethan. 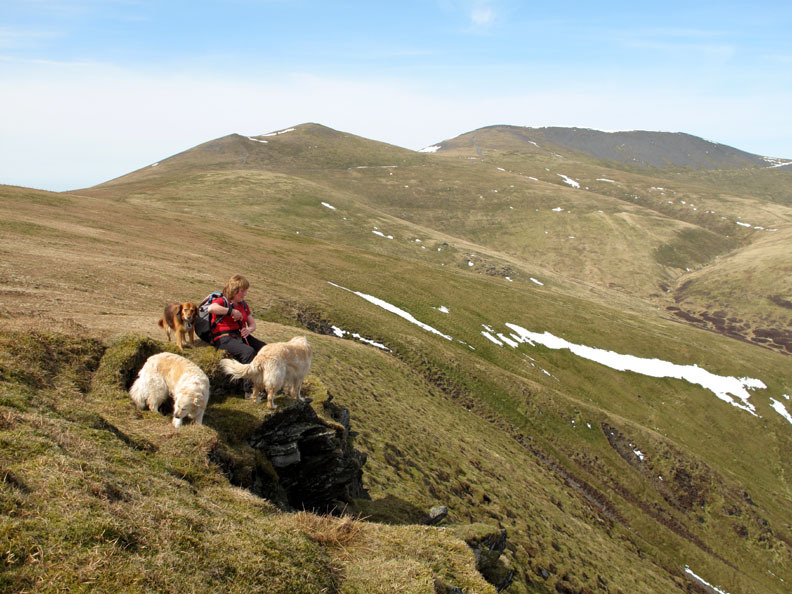 A total change of weather and a change of area too as we walk in the northern fells today. 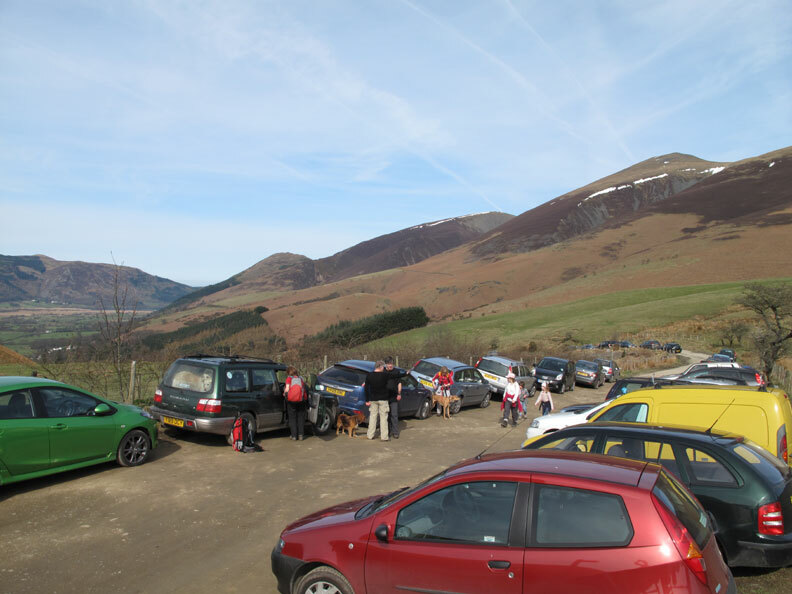 so it's off to Gale Road car park near Keswick for a 10.30 start. We all met up at Gale Road and we managed to get the last but one spot right up at the gate . . .
An excellent omen for a good day ahead ! 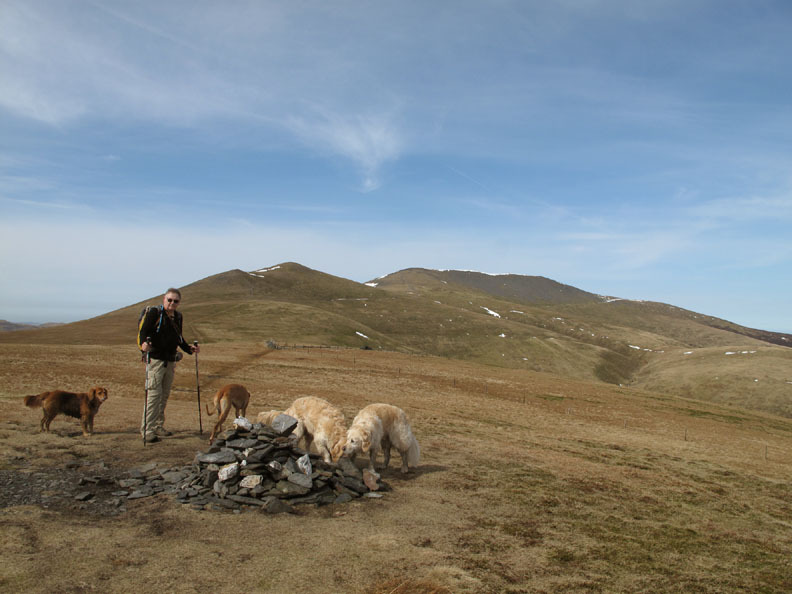 We followed the Skiddaw House track rather than Jenkin Hill . . . Recent tree planting has gone on in this area too. 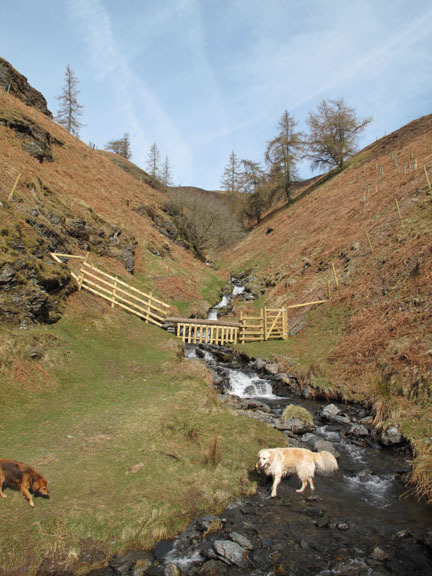 Some new fencing and green plastic growing tubes scatter the fell side around the stream. 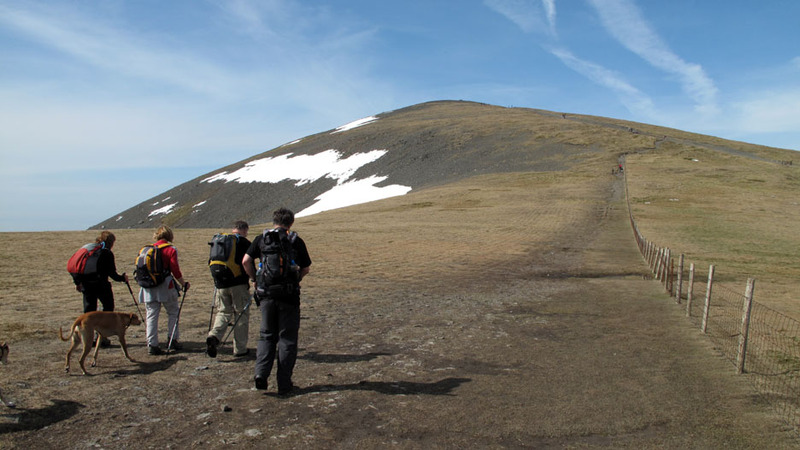 The track takes us away from Skiddaw . 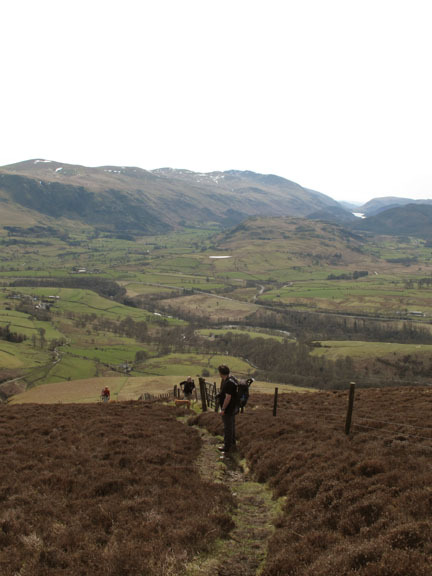 . .
but the view back is an ever improving one of the north western and central fells. The Lonscale path climbs directly up following the fence . . .
. . . on a hot day like this it is a significant climb. was spotted practicing his golf swing while his caddy, Neil holds his spare clubs ! 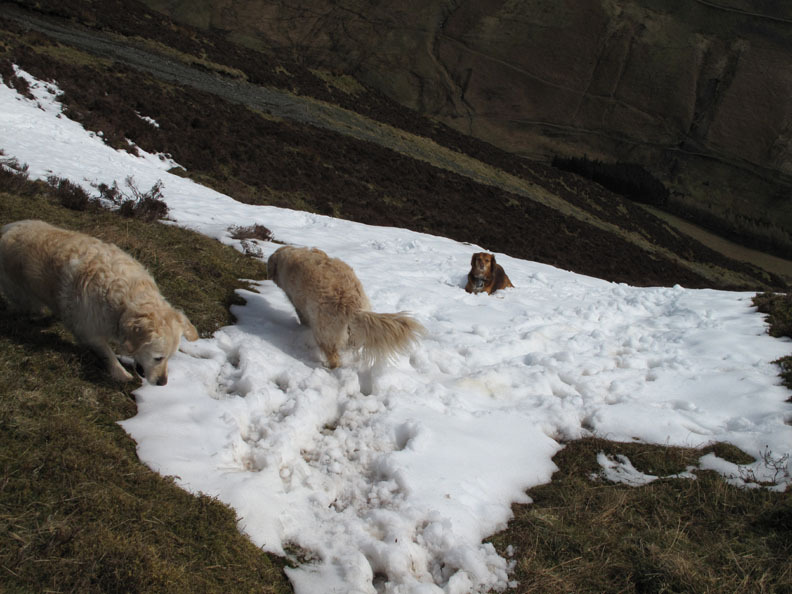 who run, slide, roll and sit in order to cool down. 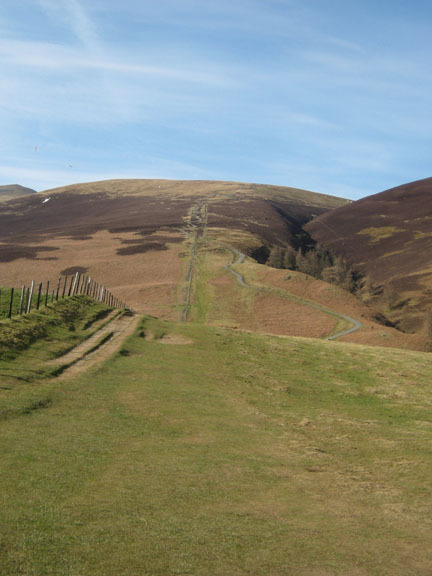 to appreciate the lovely view down into the Glenderaterra Valley. 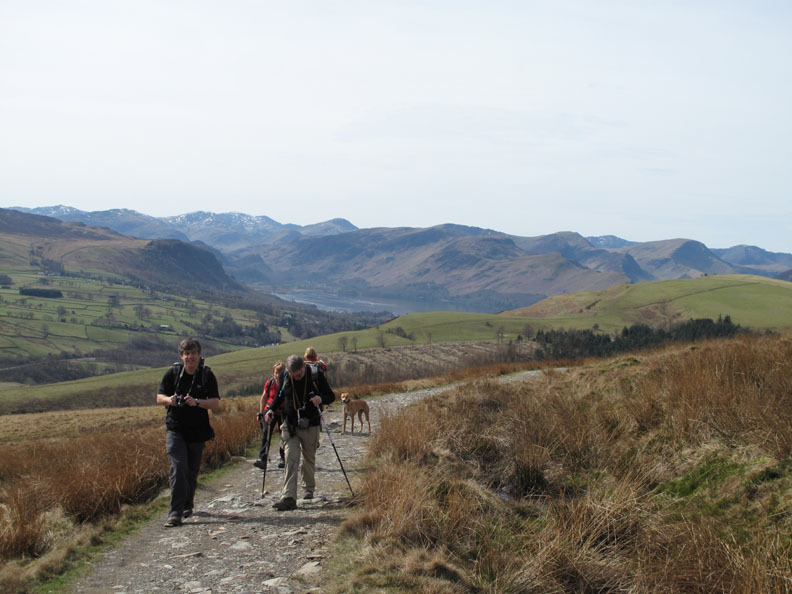 A brief stop too on the other side where there is a fine view of the rest of our walk for today . 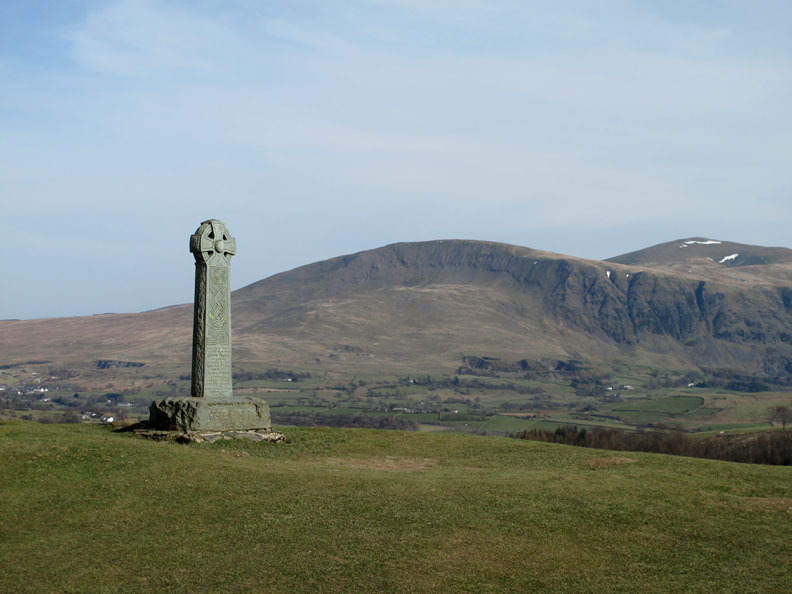 . .
Jenkin Hill, Skiddaw Lesser Man, Little Man and Skiddaw itself. 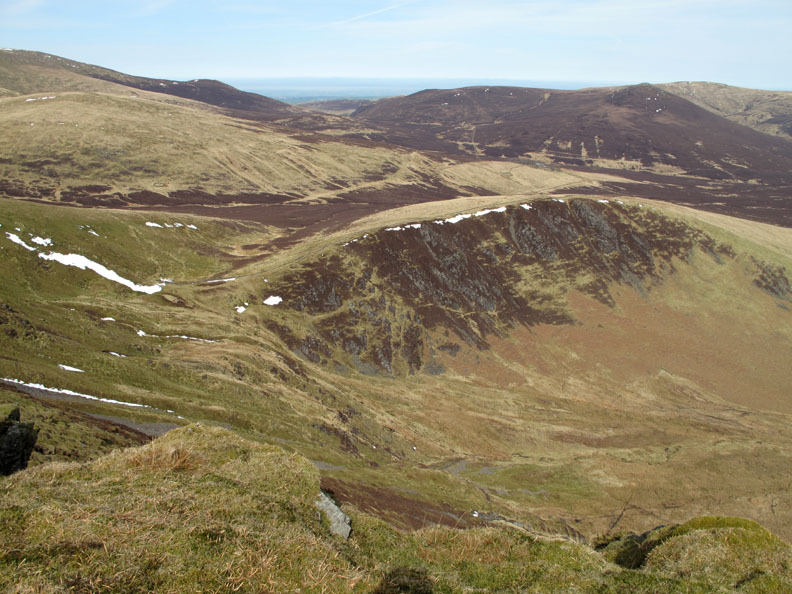 Below us at this point is the heather covered slopes of Burnt Horse, with Great Calva behind. 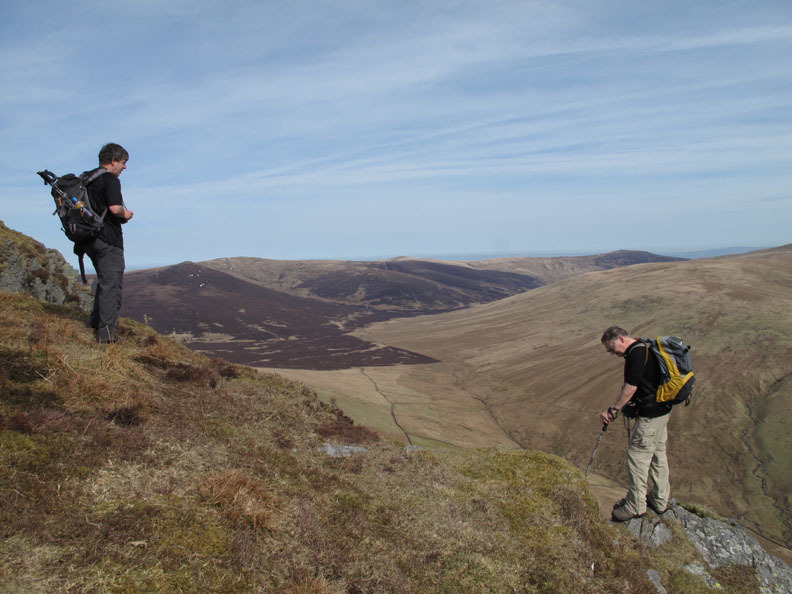 Three guys sat at the edge of the crags were amongst the very few we met on this section of the walk. One kindly offered to take a group photo of us today . . . thanks if you're watching. 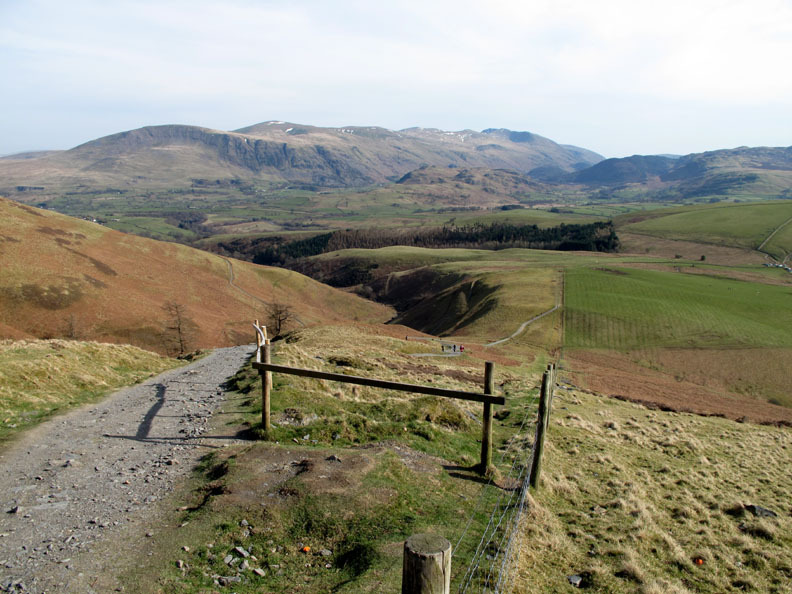 set back beyond an old fence and away from the more dramatic edge of the crags. 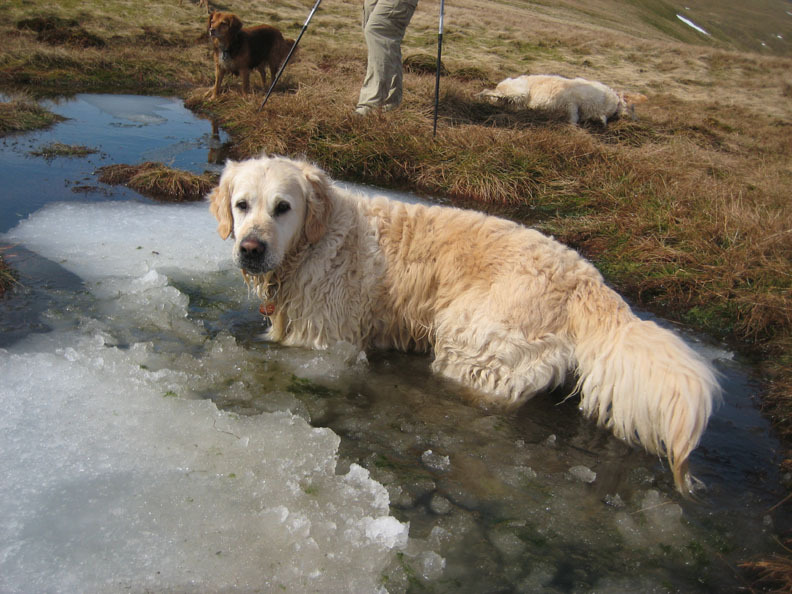 It's a hot day so we encourage the dogs to take a swim at one of the small pools along the ridge. 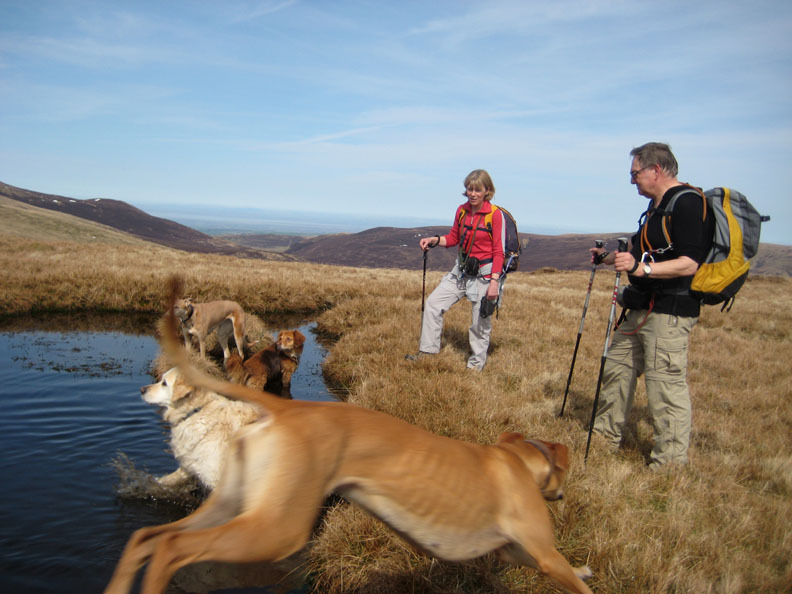 Our dogs were straight in but Jo's were most reluctant, Amber acting like a gazelle to avoid our attempts at cooling her down. Surprisingly the last of the pools still had a covering of ice. The caption just has to be . 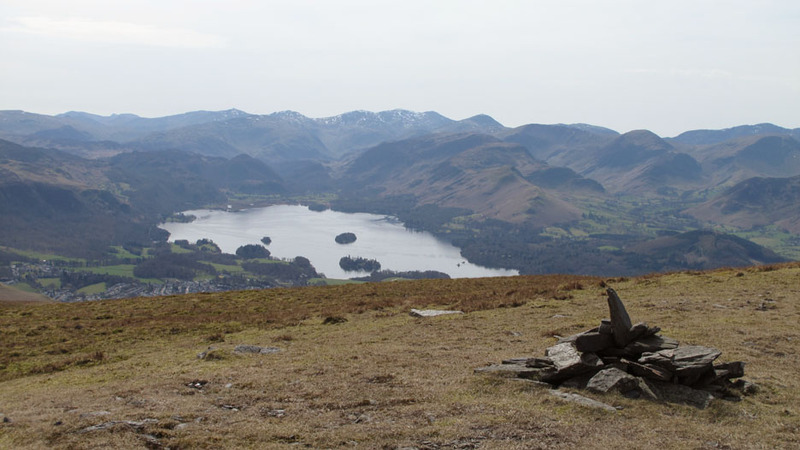 . . "Slush Puppy"
The summit of Jenkin Hill and the view down to Derwent Water. 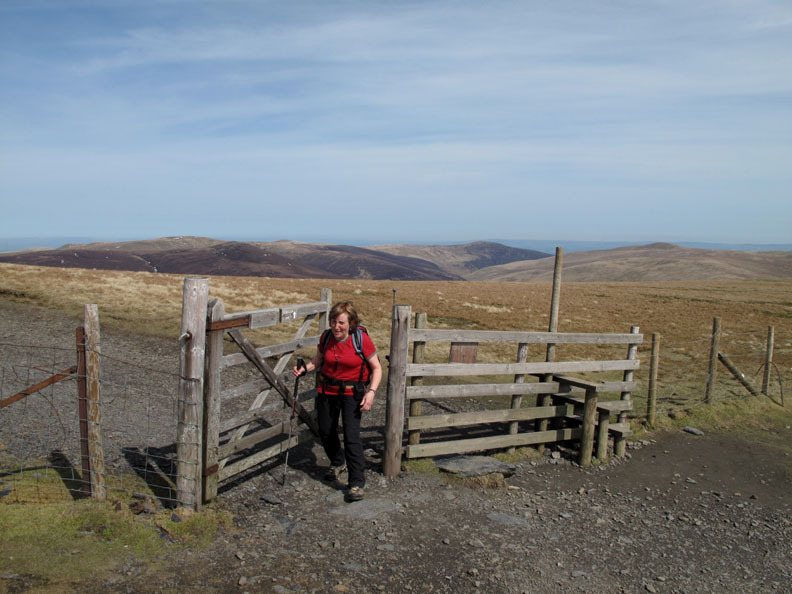 Ann walks through the gate on the main Skiddaw path. 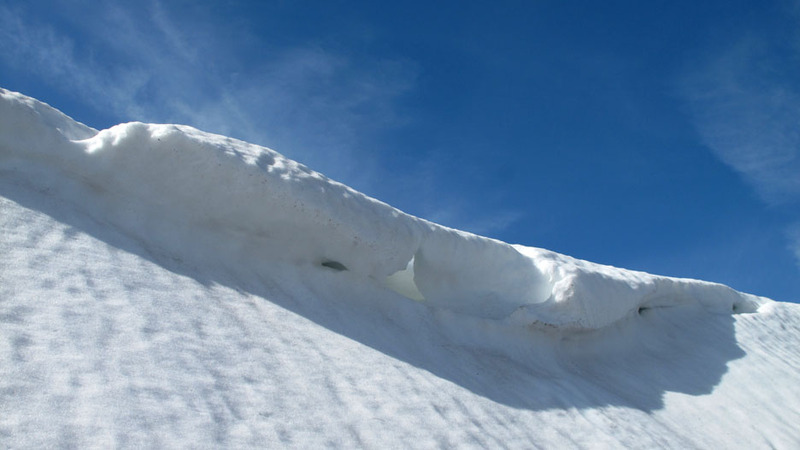 In the winter the snow was so deep that the people just walked over the top of it. 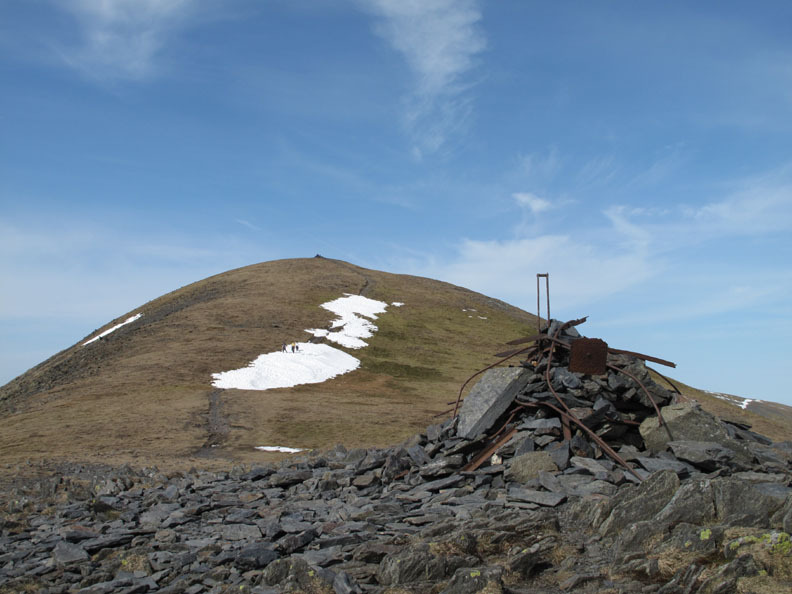 with an assortment of ironwork from the old fence system that used to cross the fell. 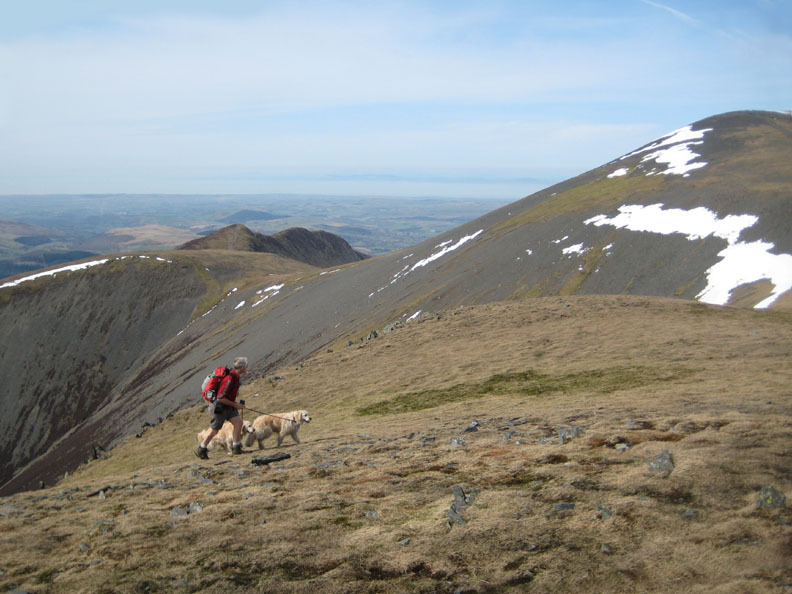 now seen in close up as we climb Skiddaw Little Man. 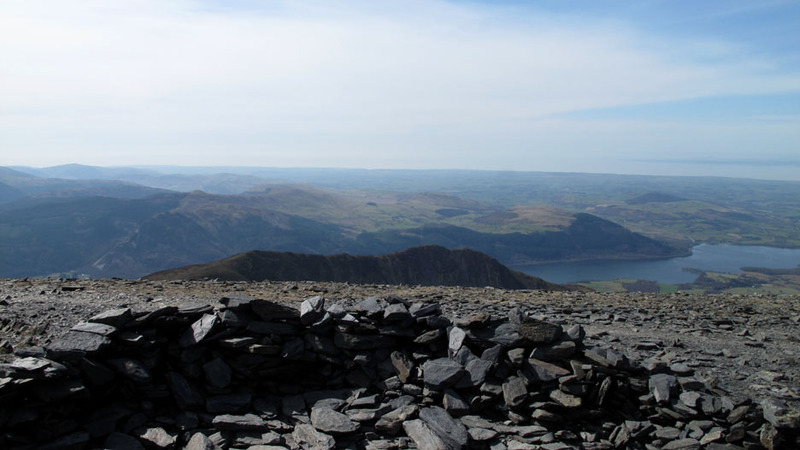 bringing his Wainwright total to 204 . . . just ten more to go. and the slight breeze has dropped to allow us a warm and leisurely lunch. 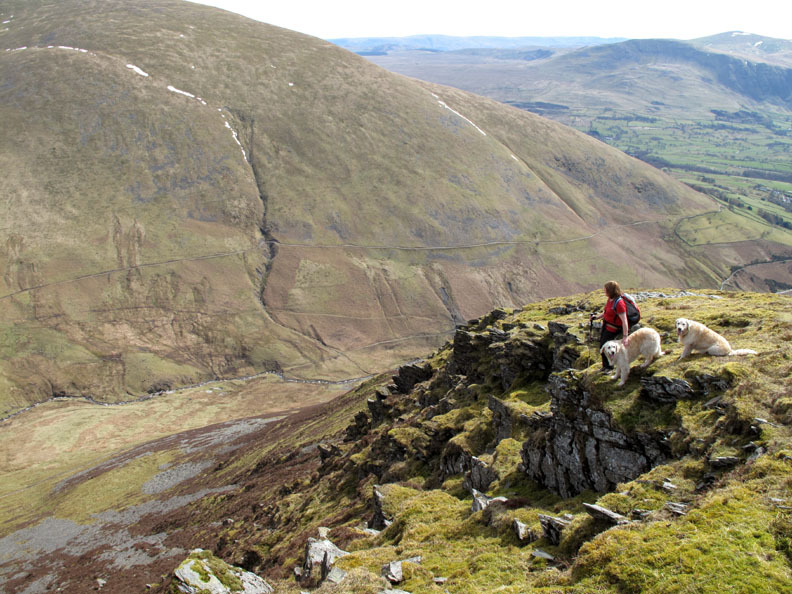 I return from looking at the view 'over the edge' to Carlside, Longside Edge and Ullock Pike. 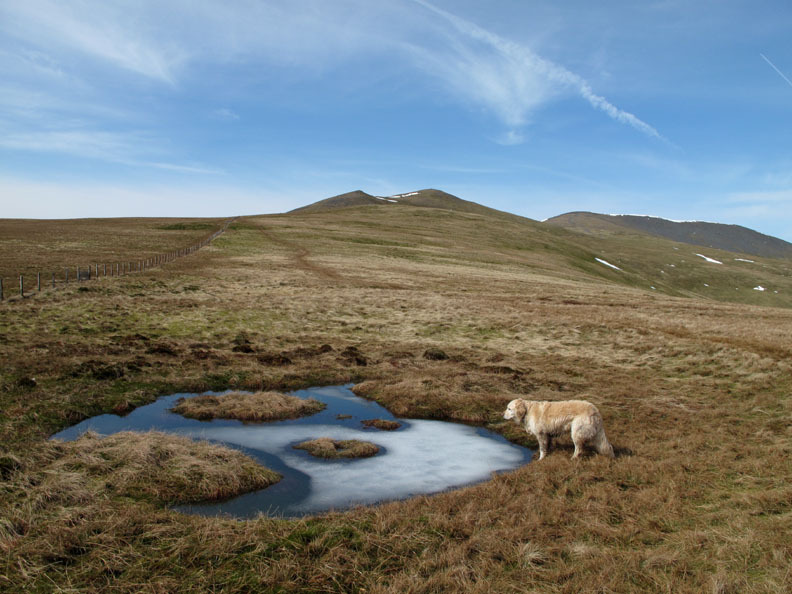 The flat coll between Little Man and Skiddaw itself makes for easy walking. Seen against a the bright sunshine, our party starts the final climb to the top. 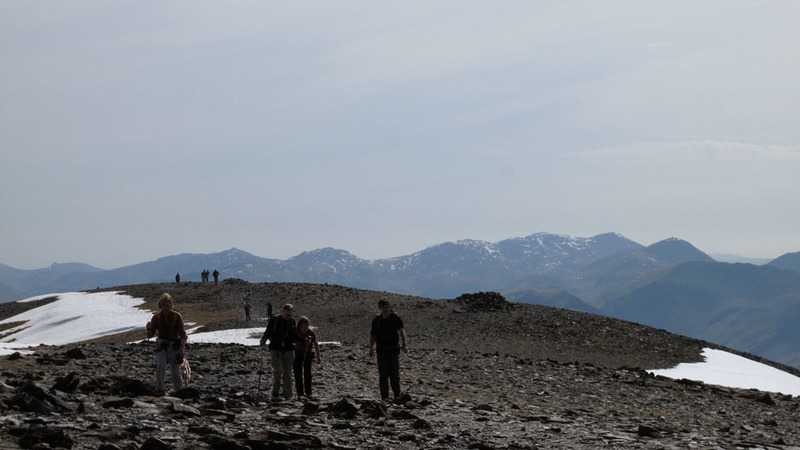 and walk along below the ridge . 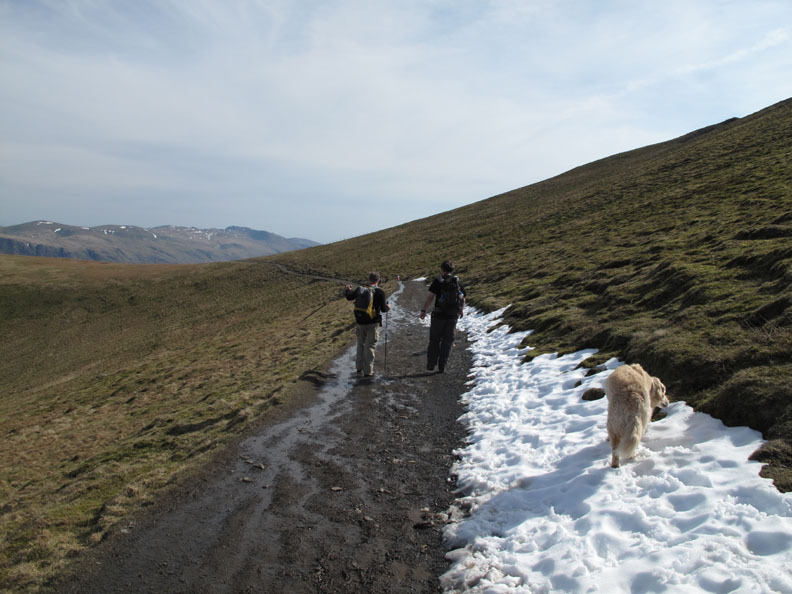 There's the remnants of the snow cornice which runs along the fell side. Blue skies and white snow. 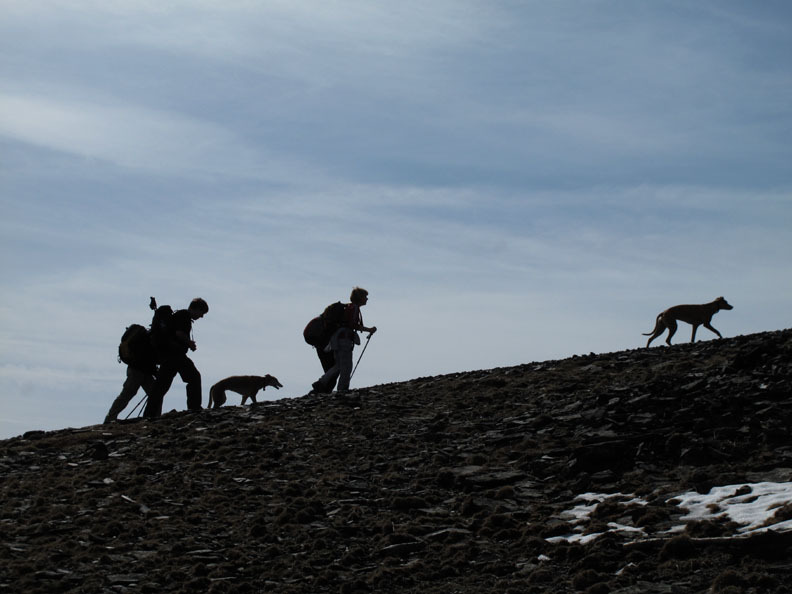 Climbing up the last few feet to join the ridge, I meet up again with the others. 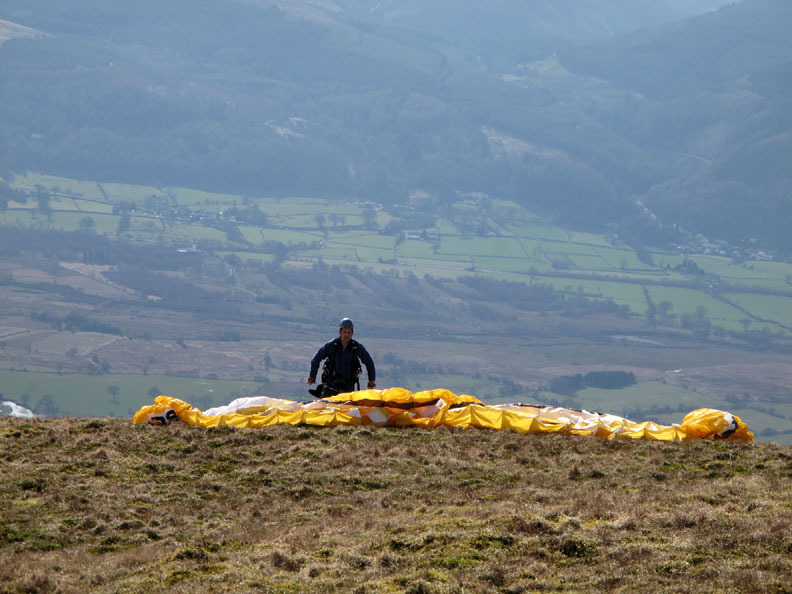 This is the middle wind shelter and the view north to Bassenthwaite Lake and across to the Solway and Scottish coasts. Together again we walk the last section to the true summit. 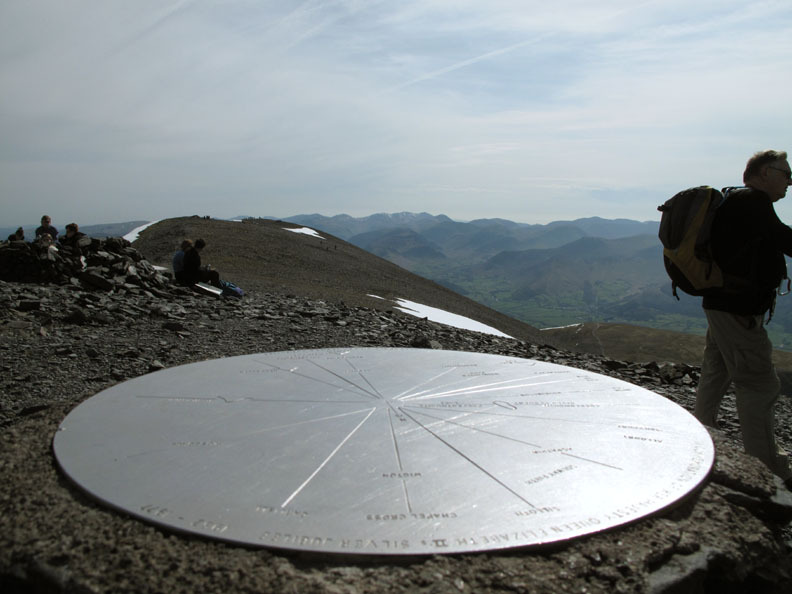 The Trig Point on the summit of Skiddaw, one of the full 'three thousand foot' Lakeland peaks. 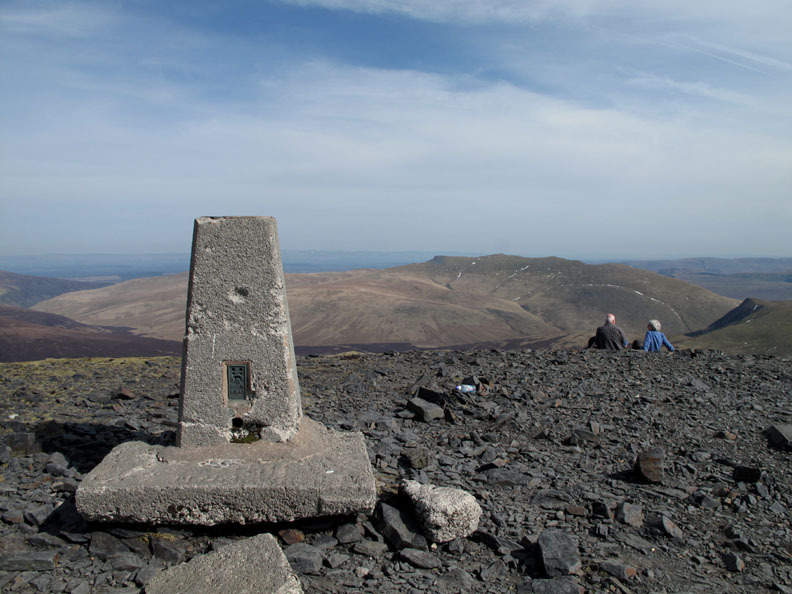 The summit also boasts a viewing cairn with an inscribed information disk. 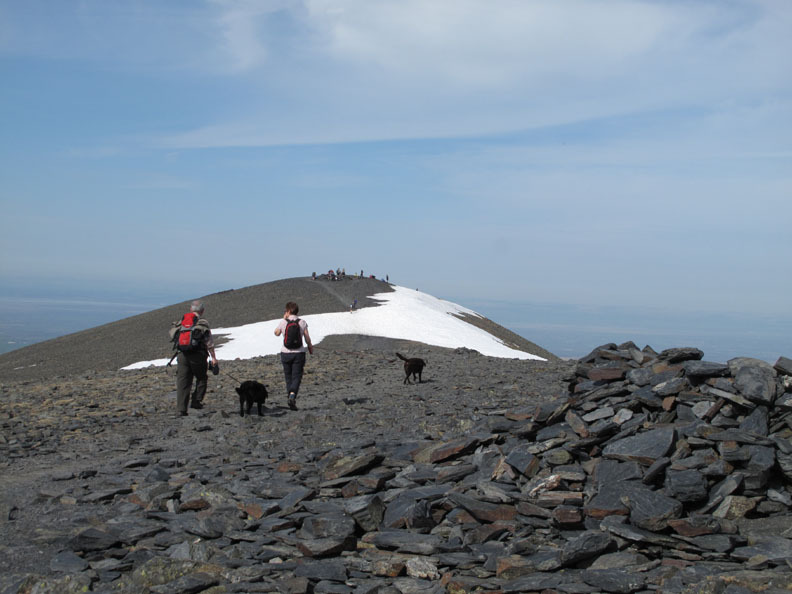 Two of the many people and dogs on the summit . . . Harry and Archie from the North East near Newcastle. 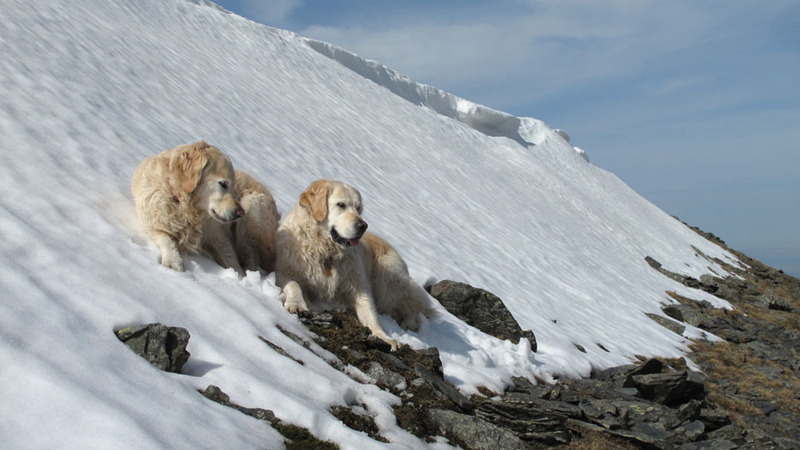 Archie (the retriever) was just ten months and enjoying his first major climb. 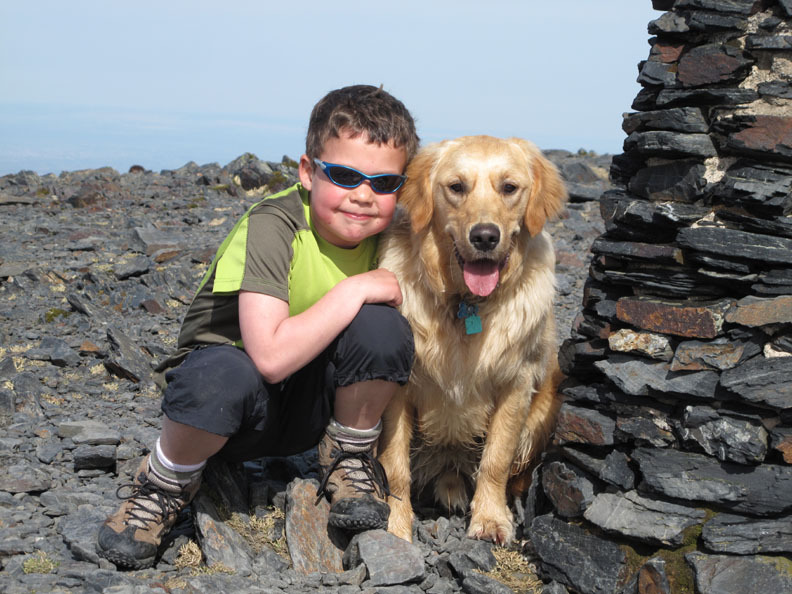 Harry's Dad was persuaded to climb Skiddaw today by Harry himself . . . Good on yer lad ! Time to make tracks for home . 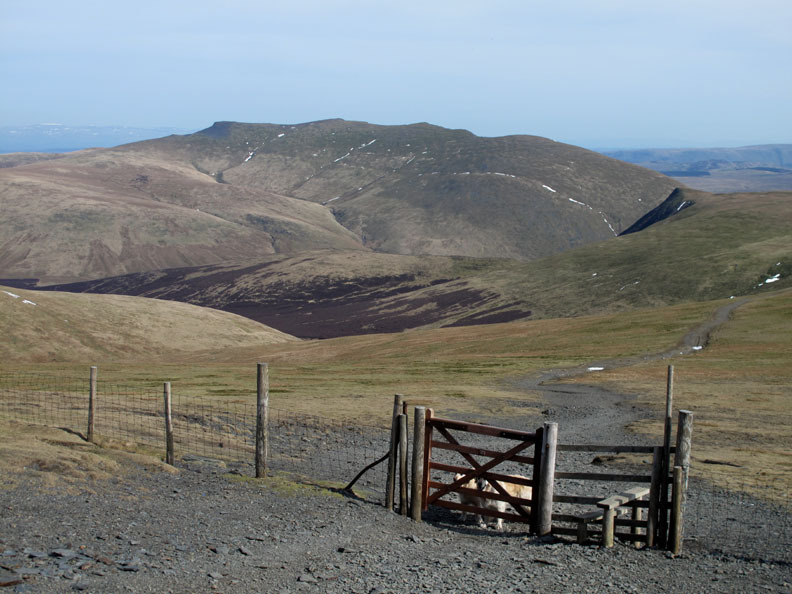 . . the gate on the way back down from Skiddaw top. 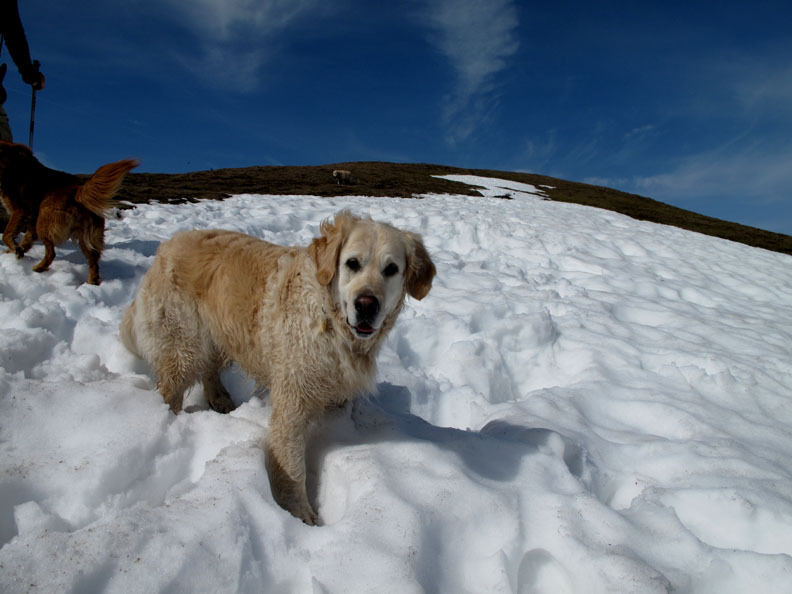 Will this be the last drift of snow the dogs will enjoy this winter ? With this warm sunshine, most remaining patches must be melting fast. 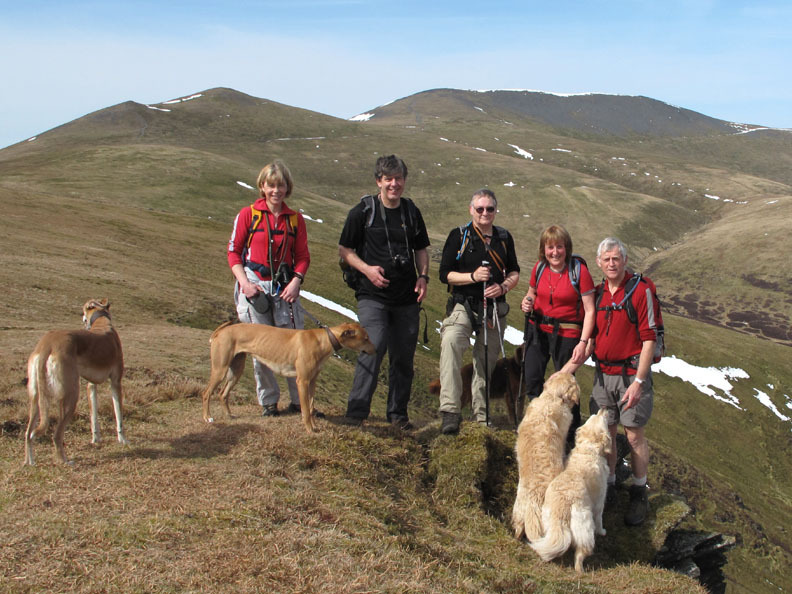 Alongside the Jenkin Hill path the parascenders were out enjoying the weather. 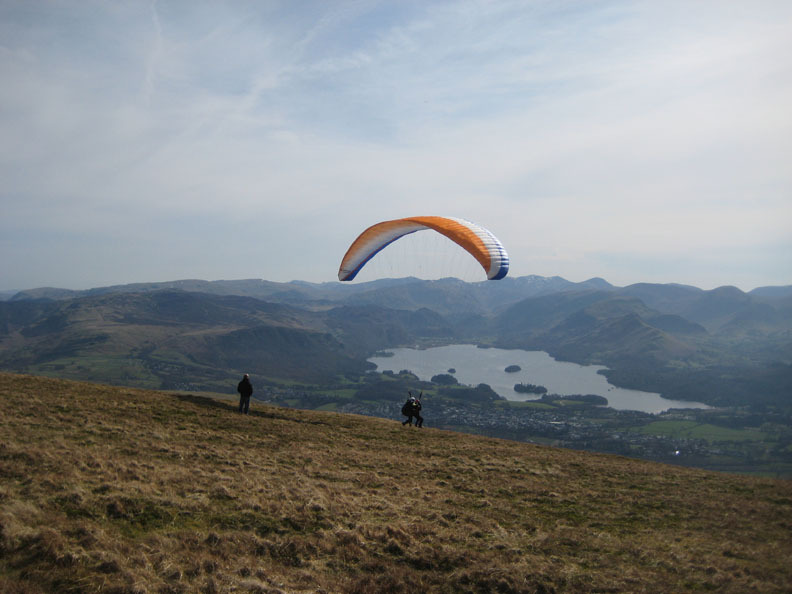 A tandem launch here and the two flyers are using the gentle southerly breeze to the full. What goes down must have come up . 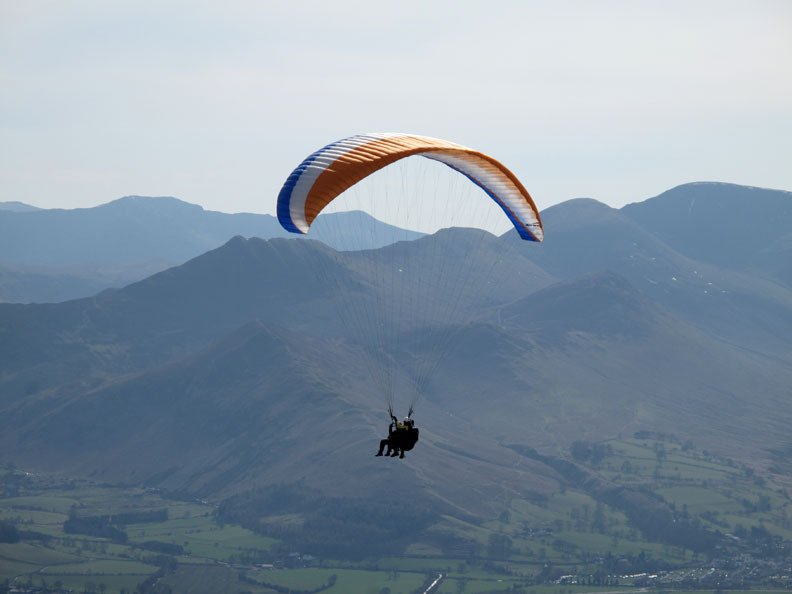 . . this gentleman walks his 'sail' up for a second flight. He spreads the complex arrangement of sail cloth and cord ready for take off. we look down on the last part of our descent . . . it's been a long steady drop down on the wide path. 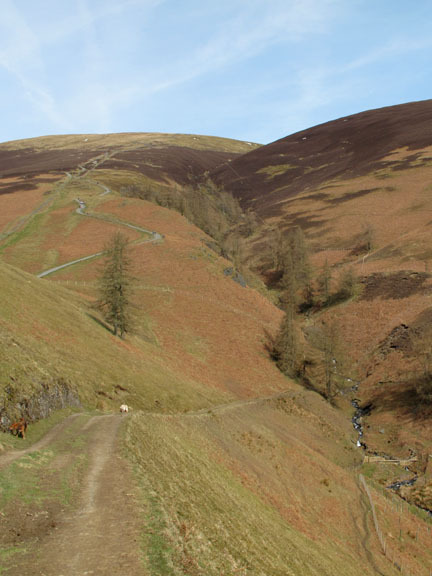 Looking back at the Jenkin Hill path . . . 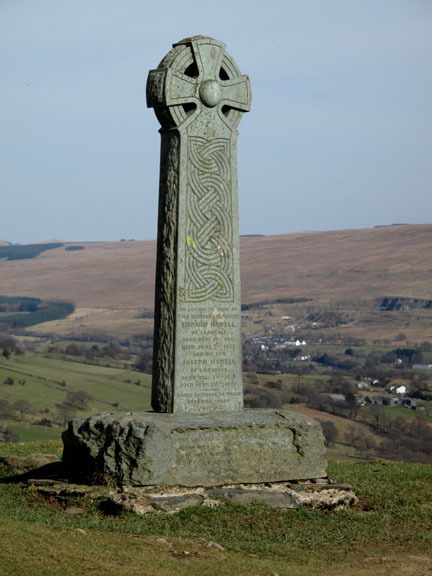 The Cross remembers members of the local Hawell family who were local farmers and famous breeders of Herdwick Sheep. and make our short way down to the cars waiting at the head of Gale Road. Mmmm . . . it's been a hot day and we've worked up a bit of a thirst . . . any ideas ? This site best viewed with . . . a parking space outside the Pheasant Inn so as to quench our thirst. A previous time up here - 31st December 2001 New Years Eve 2001 from "Morning to Night "